Not many investors thought oil prices could fall from $100 a barrel to under $40. After all, oil is the one commodity that the world simply can't do without. It is clear that the Saudis attempted a power play. They wanted to drive U.S. shale oil companies out of business and they wanted to re-establish their dominance over OPEC. On those two counts, they succeeded. They drove over 100 U.S. oil companies out of business. And even non-OPEC oil producers were basically begging them to lead a production freeze to support higher prices. So, it would seem the Saudis got what they wanted. But the irony is that while they won the battle, they may have lost the war. So when prices got too high or too low, the world depended on the Saudis to make the necessary adjustment to keep things in balance. The rise of oil production in Russia and the US meant that Saudi Arabia lost some of its influence over the oil market. They fought back the only way they knew how: by crushing prices. But in a perfect example of unintended consequences, the Saudi-driven oil bear market made U.S. shale producers lean and mean. Over the last two years, they’ve cut costs and gotten more efficient. So today, the cost to produce a barrel of American oil has basically been cut in half. Oil at $40 a barrel blows a massive hole in the Saudi budget. They’ve had to sell bonds, liquidate their foreign cash reserves, cut benefits and subsidies, and even consider selling part of the Saudi national oil company, ARAMCO. But most U.S. oil companies are now profitable with oil at $40. So the minute Saudi Arabia, OPEC, and Russia agreed to production cuts to get prices at least over $50, U.S. companies started spending more money to bring oil to market. 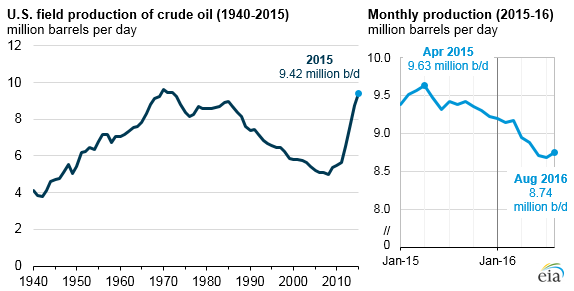 By the end of 2017, U.S. production will be up by as much as 1 million barrels a day. And that’s why oil prices have been stuck between $50 and $55 — Saudi Arabia has lost its ability to ramp oil prices at will. Oil investors must acknowledge that the global oil market has changed. And it’s because of U.S. shale and other unconventional oil reserves. In the last 10 years, U.S. production capacity has practically doubled, jumping from around 5 million barrels a day to 9.5 million barrels a day at its peak in January 2015. But in the long term (ie, 2+ years down the road), there is a very good case to be made that oil prices can head significantly higher. Because the fact remains that oil is a depleting resource. Large discoveries are now very rare. And the large discoveries that are made — like those massive deepwater fields off the coast of Brazil — are simply too expensive to drill even with oil around $100. Plus, investment was non-existent for the last 2+ years. Oil companies were simply trying to survive the price crash. As much as 5 million barrels a day of new discoveries have to come online every year in order to offset normal production declines from mature oil fields. So that two-year gap in investment has basically ensured that there will be higher prices in the future. And select oil U.S. companies will easily double in price when oil prices start to spike higher. There are two key criteria for oil companies that will double your money: cost and debt. You want oil companies that have the lowest production costs. It is these companies that will maximize profits when oil prices head higher. Right now, the Permian Basin in Texas has the cheapest-to-produce oil in the U.S. Costs are below $20 a barrel in some cases. Second, you want oil companies with a manageable amount of debt. Nearly all oil companies had to take on debt during the oil bear market. It’s probably obvious, but oil companies with lower relative debt will be better able to survive and prosper going forward. Matador Resources is primarily an Eagle Ford/Permian Basin oil play. These are two of the most prolific U.S. oil plays. Matador is expected to generate around $500 million in revenue for 2017, and $662 million in 2018. The company is worth $2.3 billion, and it carries just $570 million in debt. Matador will have no problem servicing its debt until oil prices turn around. The stock currently trades around $23 a share. Callon Petroleum is a pure play on Texas' Permian Basin. It has 391 million barrels of proved oil and oil equivalent reserves. A $2.2 billion company, Callon is expected to generate $400 million in revenue in 2017 and $626 million in 2018. Callon is very healthy with long-term debt of just $390 million. It currently trades around $12 a share. Laredo is the biggest of our oil picks, with a market cap over $3 billion. It also has the most debt, at $1.3 billion. But it has some of the best acreage in the Permian Basin. It also has massive proved oil reserves of 167 million barrels. Best of all, though, Laredo has maintained profitability all through 2016, even when oil prices were still below $40. Laredo is expected to do $711 million in revenue for 2017, and $883 million in 2018.